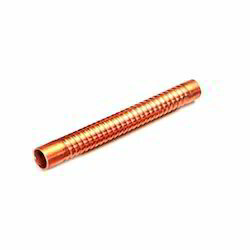 In line with clients' diverse requirements across the country, we are offering a commendable range of Low Integral Fin Tube that are used in condensers, chillers and oil coolers. For strictly adhering to industry norms, our skilled professionals manufacture these fin tubes employing superior quality raw material and the latest technology. Our provided fin tubes are checked on different parameters that enable us to deliver qualitative product at client's end. The Integral Fin Tubes is a tube where the external surface of the tube is enhanced by the process of finning and fins are drawn from the base material of the tube, resulting to increase in the surface area by 2.5 times than the plain tube area. The Extruded surface achieved through our manufacturing process is real and uniform. 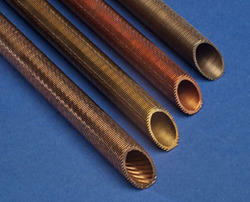 Fin Tubes are fully integrated so that the Heat Transfer, performance, life and resistance to vibration are excellent. 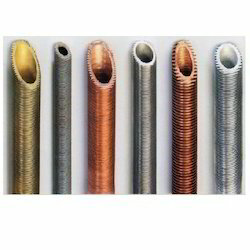 Fin Tubes can improve the thermal performance of a Heat Exchanger without changing in Shell size, Flow Arrangement and Repositioning of tubing. Integral Low Fin Tubes have a very large Heat Transfer ratio thus it is possible to reduce the volume, weight of the Heat Exchangers and finally reduce the cost. 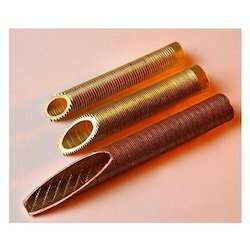 Integral Fin Tubes can be used in various Heat Exchanger Applications, Viz. Condensers, Chillers, Oil Coolers and Shell & Tube type Heat Exchangers, etc. Unit Length 20 Meters Max. With the support of highly skilled and experienced professionals, we are engaged in offering a qualitative assortment of Integral Low Fin Tubes. In these fin tubes the external surface is enhanced by the process of fining. Our offered fin tubes are manufactured using quality proven raw material and innovative technology in sync with industry norms. The provided fin tubes are exceptionally valued by the clients, owing to their high strength and low maintenance. Tube Length 20 Meters Max. The Integral Low Fin Tubes is a tube where the external surface of the tube is enhanced by the process of finning and fins are drawn from the base material of the tube, resulting to increase in the surface area by 2.5 times than the plain tube area. The Extruded surface achieved through our manufacturing process is real and uniform. NFT is having an in-house tube bending facility for manufacturing Finned "U" Bend Tubes for Heat Exchangers. Bending of "U" tubes as per TEMA-RCB (Sec. IV). Testing / Hydro testing as per specification and requirement. 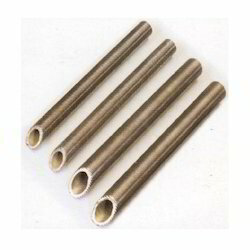 Fin Tubes can be offered for any Third Party Inspection Agency for inspection as per the customer's requirements. Being a prominent firm, we are affianced in providing our clients with a distinct assortment of Integral Finned Tubes that is widely used in power and process equipment. The offered finned are available in different diameters and sizes as per the demands of our clients. Our provided finned is manufactured using the best quality raw material and innovative technology. Apart from this, offered finned is checked against different quality measures so as to ensure its quality. Looking for Integral Fin Tubes ?